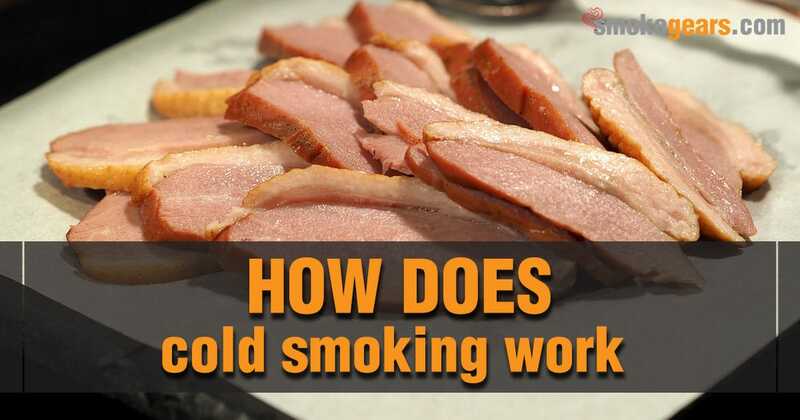 →How Does Cold Smoking Work? How does cold smoking work? If you are new to the world of grilling, this is a term which is possibly new to you as well. So, what is it? What do you need to cold smoke? Do you need the smoker thermometer to use when smoking? Regardless of where you stand as a griller, there are a few things you should know before you cold smoke. So, let’s start by discussing what it is, and how it works. Yes, you are going to want to use the best wireless meat thermometer when cold smoking. It is a good way to preserve meats, and ensure proper temperatures when grilling. Cold smoking is also the easiest form of smoking, for great taste and preservation. You don't even need a smoker, you can use a grill. Cold smoking is a process which smokes meat without exposing it to heat. It can take days or weeks to complete. It is ideal to yield salty or drier foods, which need to be preserved. Since you are smoking at under 85 degrees F, you can imagine how long it is going to take for certain meats. Cold smoking does help yield a unique flavor profile, but does require a learning curve. Since you aren't exposing it to high heat, cold smoked foods will have a profile similar to uncooked foods. Something similar to deli meats once you are done with the process. Also know the smoke doesn't fully preserve the food. You will have to keep the finished product refrigerated until it is ready to be used. It is best to be done in colder months of the year. You don't want to over expose to high temperature and climates. Temperatures which are too high can put a halt to the cold smoking process. So, just as is the case with traditional smoking, certain conditions should be in place with cold smoking. Namely that of temperature control. You want to maintain cooler temperatures. Not only to ensure you complete the process, but also to ensure foods are properly preserved as well. The cold smoking process gets the smoke/heat, from an indirect chamber. This is different from where the meat is actually located that you are smoking. Smoke goes through a series of pipes to reach the meat. This is the main reason it does take so long to reach the desired temperature in the process. The meat is typically in another room. It is also maintained as close to room temperature as possible. This is going to ensure the best cook time and even distribution during the process of cold smoking. The longer the meats are left in, the richer the flavor profile. They are going to be richer, smokier, and have a hickory taste with longer duration of smoking. Cold smoking doesn't technically cook the meat, but cures it. Since there is no direct heat transfer, it is only indirect heat which is going to reach the meat you are smoking in this manner. Prior to placement in the chamber, meats are usually brined or covered in salt. Again this is going to aid in the process of curing, and it is going to help eliminate bacterial build up when grilling. Salt helps to preserve the meat. It is going to help eliminate the bacterial build up on the exterior portion of the meat during this long process. Foods such as lox or fish are typically cold smoked. Again, you will notice rich, salty texture with these foods. You will also know that they are not cooked entirely through. Salt helps in preservation and it also helps preserve the rich flavor profile you get with these foods. A temperature of about 65 degrees F, versus about 175 to 200 F for hot smoking. A huge difference in the time required. Cold smoking can last days or weeks. Hot smoking is going to require a few hours of grilling. Cold smoking doesn't require prep work. You don't have to season. You simply add salt for preservation purposes. Cold smoking requires two chambers. The meat is never going to come into contact with the grill directly. The fact that you never place meats on the grill is one which many people don't understand with cold smoking. It is an indirect heat and this process will require a great deal of time to complete. You also have to understand the meat is not fully cooked. Hence it is not going to be touched by direct heating elements during the transfer process. Why don't you try to cook a frozen steak in the cold weather? It will add extra flavour to your winter life. Can you cold smoke anything? Yes and no. Of course there are certain foods which must reach a certain temperature for safety purposes. So for these types of meats, you are better off with the traditional smoking process. However, if you want to cure, or want to have a particular type of meat which is under cooked, this might be a process you decide to try. As mentioned, you are going to require days if not weeks to cold smoke certain items. So you will require a great deal of patience if this is a process you are going to try out. Give it time, do your research, and learn how it is going to work. This is the best way to familiarize yourself with the new process you are going to try out. Cold smoking is not something for everyone. And some people truly hate the process, cause they don't know proper cold weather smoking tips. But, if you want to try it out learning how cold smoking does work is your first step. Now this time you will get cold smoking kit in the market, it will make your work easy. These are some things to consider if you are new to the process. You will quickly learn it works well with some foods/meats, but not so well with others. It will require some trial and error.